What is it that makes us different? Why do Mormon missionaries knock on the doors of Christians if they preach the gospel of Christ? It is more than a desire to gather sheep into our flavor of worship. Since the Garden of Eden the Lord has given us instructions on what we ought to spend our time doing in life. His pattern is to choose a mortal man, call him a prophet, and dispense the information through him. He needs two things: access to truth and authority (priesthood) to preach it. It’s simple and efficient. At least, it is when the people listen to him. Invariably, the backlash against the prophet leads to a revolt against him and against God. When the prophet is killed, the dispensing of gospel truth is thwarted and the people are left in the dark. We Mormons call this “apostasy.” Fortunately, the Lord has always followed apostasy with a new prophet and a new dispensation, beginning with Adam, then Noah, Abraham, Moses, and Elijah, etc. Case in point: John the Baptist was called as a prophet to prepare the way for Jesus’ ministry. He and Jesus taught the gospel truth, restored the priesthood power, and organized the Church of Jesus Christ. Jesus called Peter and the other apostles to lead the flock after His departure. John the Baptist was beheaded, Christ was crucified, and the apostles were rejected and murdered. They who held the authority of the Lord were eliminated and the world became apostate again. This time it lasted for over a millennium, allowing a smattering of false teachings from non-prophet church leaders to creep in. Reformers such as Martin Luther, John Wycliffe, Roger Williams, and others saw problems in the religions of their days; they did their best to correct them, but lacked the capacity (and the authority) to fully revert to Christ’s original church. They could not authoritatively speak for God, since he had not spoken to them or given them permission, and many of these reformers recognized that fact. Joseph received an answer from the lips of the Savior himself: That his Church was in apostasy. There were no prophets on the earth and there hadn’t been for over a thousand years. However, even in these demoralizing words was a message of hope: the apostasy was now broken, and Joseph was receiving direct communication from God. Over the course of Joseph’s life, he was visited by the Lord, and also by other angelic messengers, many more times. He was chosen to be a prophet and through these visitations the priesthood authority was restored. The church was reorganized upon the foundation of apostles and prophets. Now, we carry this amazing message of hope to all nations of the earth. We are honest in our desire for others to know that the Lord’s work is restored. His successor, Thomas Monson, is the living prophet today. We know it, and we want you to know it too. God knows whether this is all true, and I daresay he has an opinion on the matter. Ask him yourself. I have, and so have millions of now-Mormons. You may not receive as glorious a visitation as Joseph did, but he will answer you. Often it comes as a feeling from the Holy Ghost, or an idea you hadn’t thought of. Maybe in a word from a neighbor. Ask and ye shall receive. If you won’t ask, you don’t receive. The Holy Trinity is God the Father, God the Son, and God the Holy Spirit. They are three IN one person. They always travel together, never separated. 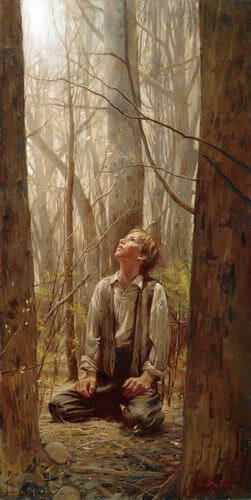 Therefore, the boy Joseph Smith could not have been visited by only the Father and the Son as purported in your article. The word of God is complete without Joseph Smith’s additions. I implore you to read Revelation 22:18,19.
Who says the Holy Spirit wasn’t there? Excellent summation of the apostasy and how the true church has been restored to the earth. Hope folks take your challenge to study and pray about the message. It will be a life changing event.